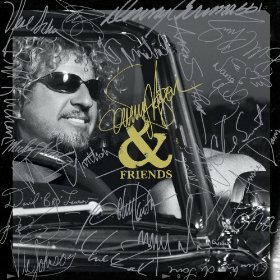 Ex-Van Halen and Montrose frontman Sammy Hagar’s Sammy Hagar & Friends sees “The Red Rocker” enlisting some A-list friends on covers and new songs. These 10 run through a few styles, but pretty much stay to a semi-blues stomp with straight-ahead drumming, lots of slide playing and Sammy’s usual scream-singing in a slightly lower register. Andre Thiery’s accordion pushes the Cajun “Father Sun,” Kid Rock duets with Hagar on a shouting “Knockdown Dragout,” Toby Keith is featured on a slightly salsa-like cover of the Jimmy Buffett hit, “Margaritaville,” and Heart’s Nancy Wilson lends her soft warble to the Hawaiian-sounding, equally soft “All We Need Is an Island.” Don Nix’s classic, “Going Down (Live in Studio-Take 1),” ends the album, once again with Neal Schon wailing.